Cabinets are one of the most important decisions in a kitchen or bath remodel. Custom? Semi-custom? Stock? The choices can be overwhelming. This quick rundown will help take some of the guesswork out of choosing your cabinets-to-be. Stock cabinets are found in big box stores. Think of IKEA, Home Depot, or Lowe’s. While this type of cabinet is the cheapest route, it is important to consider the quality and measurement issues that sometimes arise with prefabricated cabinets. Stock cabinets are pre-manufactured in specific sizes, with few if any options for customization. 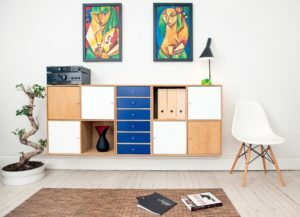 They are off-the-shelf products in a limited range of styles with many needing to be assembled after you purchase them. Stock cabinets don’t have the dividers, dish trays, trash holders; roll out drawers, sliding shelves etc. They have a limited species of woods, stain colors and door styles. Also, their hardware is typically not of the highest quality. Their drawers often do not have full extension guides or soft or self-closing mechanisms. Semi-custom cabinets come in a general style and offer customization of basic finishes/sizes. Semi-custom units are like stock in that they’re also pre-manufactured but come with a wider array of options and in more sizes than pure stock cabinets. With semi-custom, you have some ability to pick and choose various details to tailor an otherwise pre-built stock product. In other words, you have some customization choices. Custom cabinets are created from the ground up to meet your exact specifications. Custom cabinets are built with no limitation on size, style choices, wood grade or finish. They are truly made-to-order. Stock cabinets are like the car you buy right off the dealer’s lot. You have to take it for what it is, with no ability to choose any options or upgrades. Semi-custom is similar to the car that you factory-order through the dealer, with the ability to specify color, upholstery and other options. It’s still a Ford or Chrysler and it’s mass-produced, but you have a list of options to choose from and have some say in the makeup of the final product. Custom cabinets are analogous to walking into the dealership and having them build a completely new car for you, per your design, from the ground up, with no boundaries whatsoever. And it doesn’t have to look anything like a Ford or Chrysler. At Randal G. Winter Construction Inc. we work with all types of cabinets. 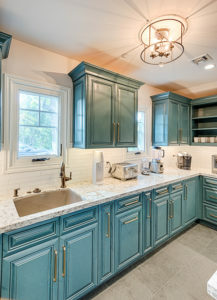 When it comes to custom cabinets the world is your oyster as there are plenty of options to choose from. However, if semi-custom cabinets work better for your project we are a dealer in Diamond Brand and Custom Cupboards cabinets. These semi-custom cabinets are the best available. Find out what’s available and the pros and cons associated with each. So, ready to remodel your bathroom or your kitchen? Check out our online gallery for ideas and inspiration. Or, visit our showroom for samples and a complimentary consultation. We look forward to making your remodel vision a reality!